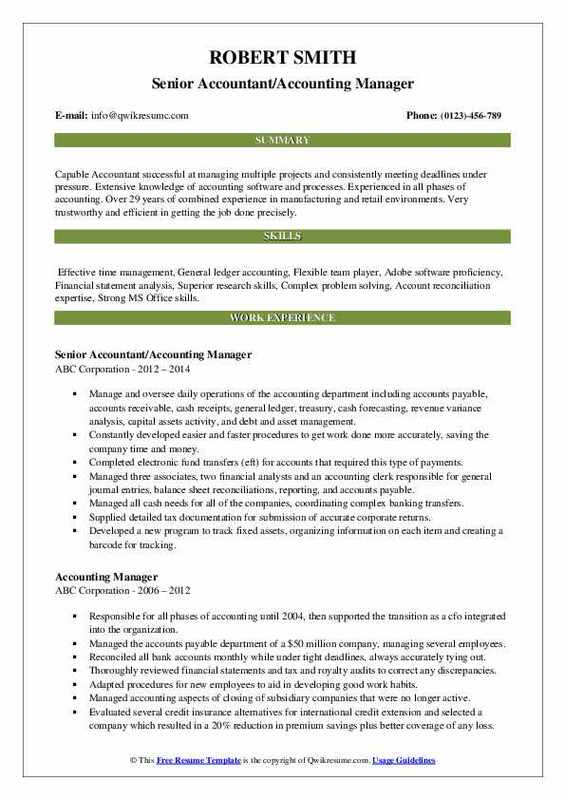 An Accounting Manager job description lists certain vital duties and responsibilities like planning and overseeing the accounting tasks of the company, and supervising the day-to-day accounting operations. 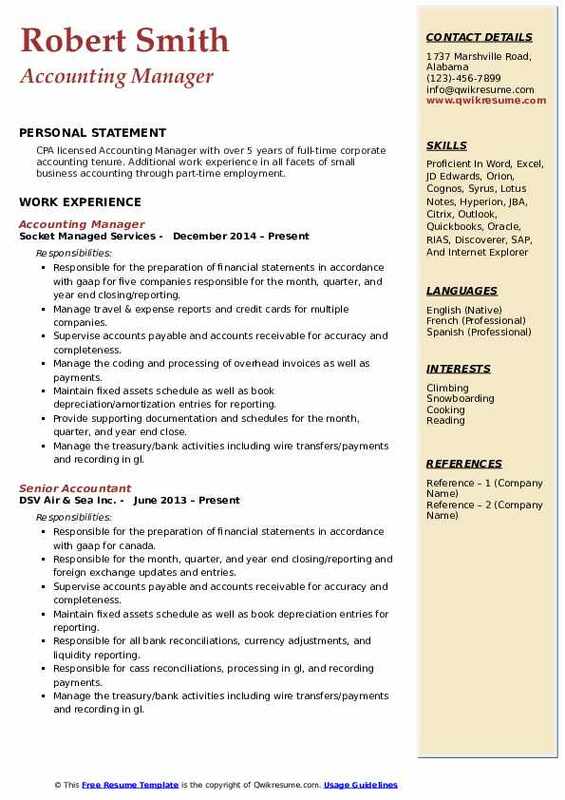 Other vital tasks included on the Accounting Manager Resume include – managing and overseeing accounting department tasks pertaining to A/C receivables and payables, cash register, general ledger, payroll activities, treasury and budgeting; and cash forecasting; establishing and enforcing proper accounting methods, meeting financial accounting objectives, and completing annual audits of the company. 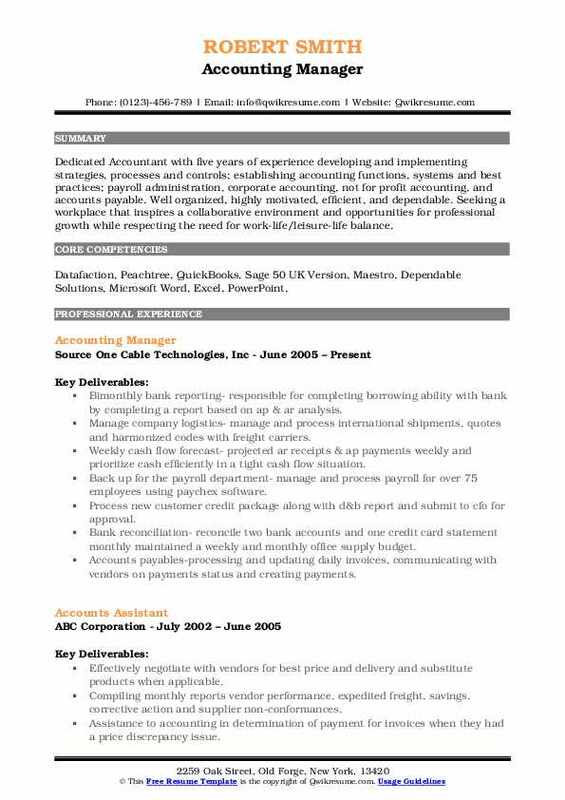 To fulfill the above-mentioned tasks, these skills are crucial – excellent knowledge and experience with accounting software and databases, a good understanding of accounting principles and practices, a thorough knowledge of the laws governing financial obligations, advanced accounting software knowledge and the ability to manipulate large amounts of data. A bachelor’s degree in Accounting or finance is the minimum qualification required for this employment. Summary : Resourceful and innovative professional with over 25 years of accounting and financial management experience within a broad range of industries. My expertise is initiating projects and programs that boost efficiency in financial reporting and company cash flow. Also a hands on manager with proven skills in analysis, organization, troubleshooting, research, training, monitoring, and improvement of operations. Reviewed and presented financial reports with upper management in a clear and concise manner. Made recommendations to the CFO ways to improve the preparation of accounting entries to speed up month end closing.Recommendations resulted in reducing the closing process from ten days to seven days. Modified and converted into excel, the accounting software generated twelve (12) month income statement trend. Some of the modifications included an ebitda section and a current month vs Previous month variance column with explanations/justifications of major fluctuations in the revenue and expense accounts. Worked with auditors in verifying financial information/procedures, for two sets of charts of accounts. Reviewed and approved weekly a/p invoices and check runs with the a/p specialist, generated reports in a timely manner. Reconciled month-end closings, as well as reviewed all customer tenders and contracts. Educated stakeholders in complex revenue recognition issues that required special attention to customer contract requirements. 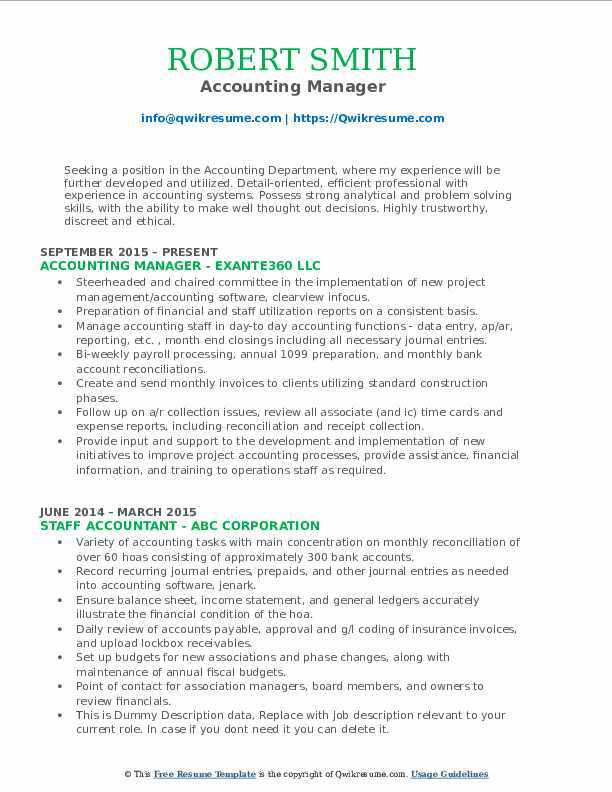 Objective : Resourceful accounting and financial professional with exceptional experience in management including accounts payable, accounts receivable, fixed assets, cash flow, inventory, sales and property tax, and payroll for multiple companies according to GAAP. Experienced in initiating new programs and documenting accounting process flows for organizations to ensure compliance. Saved organizations expenditures in several areas by consistently improving and researching new processes. Skills : System knowledge in Microsoft Office including Excel and Word as well as Symitar/Episys, Epicor, FRX, Crystal Reports, Great Plains/Dynamics and Sage/Platinum. Managed phases of accounting functions including cash management, accounts payable, fixed assets, general ledger reconciliations, payroll (with outside vendor) and monthly financials. Reviewed and processed monthly financials for branches and department reporting. Experienced in the use of episys/symitar for general accounting and maintaining member accounts. Used several outside websites to perform other duties such as fis for debit card processes, clientlink for credit cards, ach, shared draft processing and other related financial institution programs. Exported data into excel for more detailed monthly financials, analyze variances to budget and generate reporting for the board of directors, monthly. Supervised and reviewed the growth of 2 direct reports in the accounting department. Implemented better procedures and helped the department become cross trained in daily duties. Worked very closely with the it department to implement several process changes to improve and automate daily functions of accounting duties and other departments, which has saved time and resources. Worked with several outside organizations that performed audits in many areas for financial institutions. Worked on several cleanup projects for the organization, which in turn resulted in substantial reduction to costs. Summary : Capable Accountant successful at managing multiple projects and consistently meeting deadlines under pressure. Extensive knowledge of accounting software and processes. 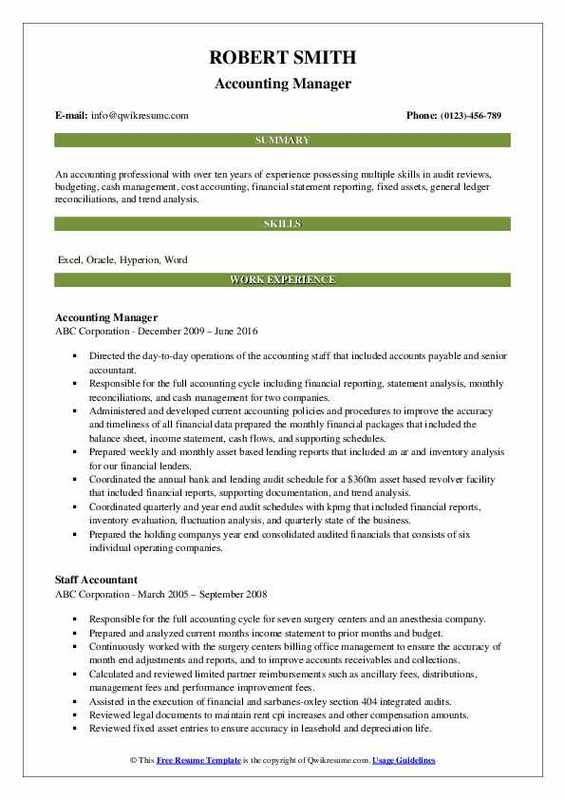 Experienced in all phases of accounting. Over 29 years of combined experience in manufacturing and retail environments. Very trustworthy and efficient in getting the job done precisely. 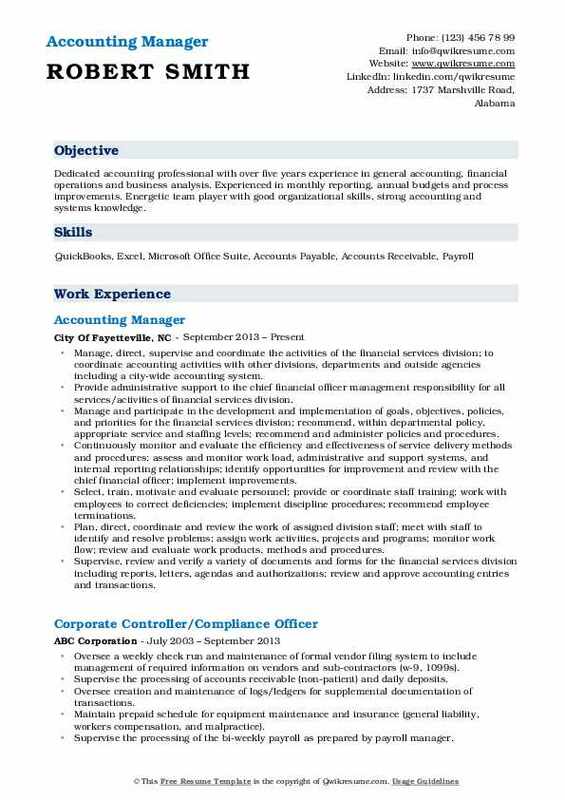 Skills : Effective time management, General ledger accounting, Flexible team player, Adobe software proficiency, Financial statement analysis, Superior research skills, Complex problem solving, Account reconciliation expertise, Strong MS Office skills. Manage and oversee daily operations of the accounting department including accounts payable, accounts receivable, cash receipts, general ledger, treasury, cash forecasting, revenue variance analysis, capital assets activity, and debt and asset management. Constantly developed easier and faster procedures to get work done more accurately, saving the company time and money. Completed electronic fund transfers (eft) for accounts that required this type of payments. Managed three associates, two financial analysts and an accounting clerk responsible for general journal entries, balance sheet reconciliations, reporting, and accounts payable. Managed all cash needs for all of the companies, coordinating complex banking transfers. Supplied detailed tax documentation for submission of accurate corporate returns. Developed a new program to track fixed assets, organizing information on each item and creating a barcode for tracking. Performed all month-end and year-end financial closing procedures and submitted to the corporate office with supportive excel documentation, including charts and grafts. 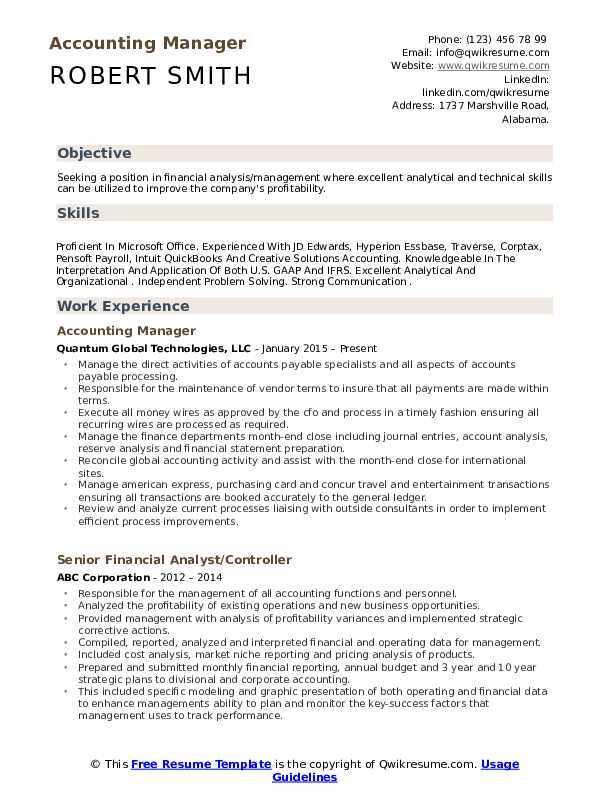 Summary : Talented professional with background in accounting and finance; extensive knowledge of AR/AP, Microsoft and QuickBooks software. Summary : Accounting and Finance professional with extensive experience in analysis, reconciliations and month-end close and preparation of financial statements ERP software: Banner Finance, Symitar, Sophis, and Fiserv Systems. 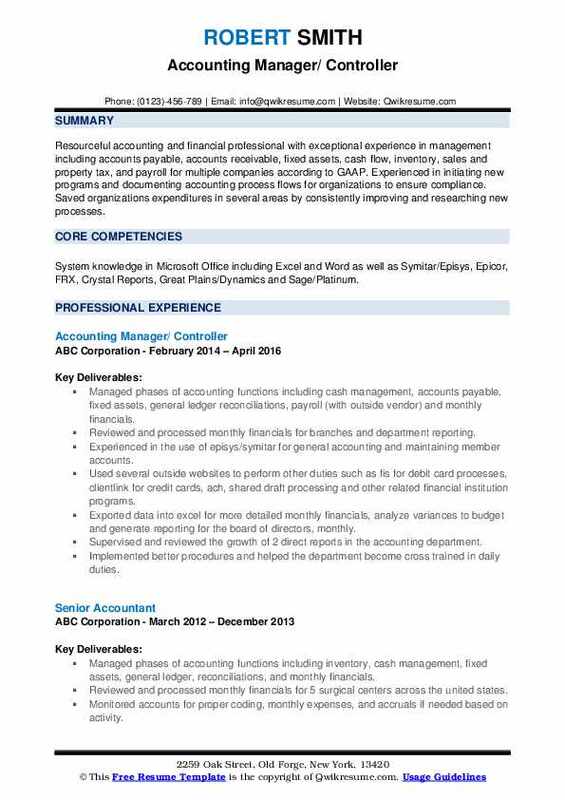 Skills : Financial Analysis, GAAP compliance, Financial Reporting, Audit Compliance, Advanced Excel, and Access Business Process Analysis, GL Accruals & Monthly Closing Bank Reconciliations, A/R and A/P. Produced new p&l statements for subsidiaries, which were used to close unprofitable lines of business. Implemented purchase procedures to validate orders made versus orders receive and compare amounts ordered to amount used. Prepare and investigate ongoing audit data for tax accountant and the irs agent. Work in collaboration with tax accountant, create annual tax returns and ongoing 433b processing for multiple companies. Implemented installment agreements and prepared account reconciliations that reduced tax accountant fees. Developed standard procedure to substantiate invoicing and billing for inter-company services and shared expenses by developing standard procedures. The procedures were based on revenue percentages per company and division compared to the whole. Worked closely with third party payroll provider to update and complete payroll biweekly for multiple companies and divisions. Cost savings of reconciled payroll deductions for 401k, aflac, foc etc to ensure proper funding and employer match. Identified several people on payroll that were not employed by the company saving the company 120k annually in salary, taxes & fees. 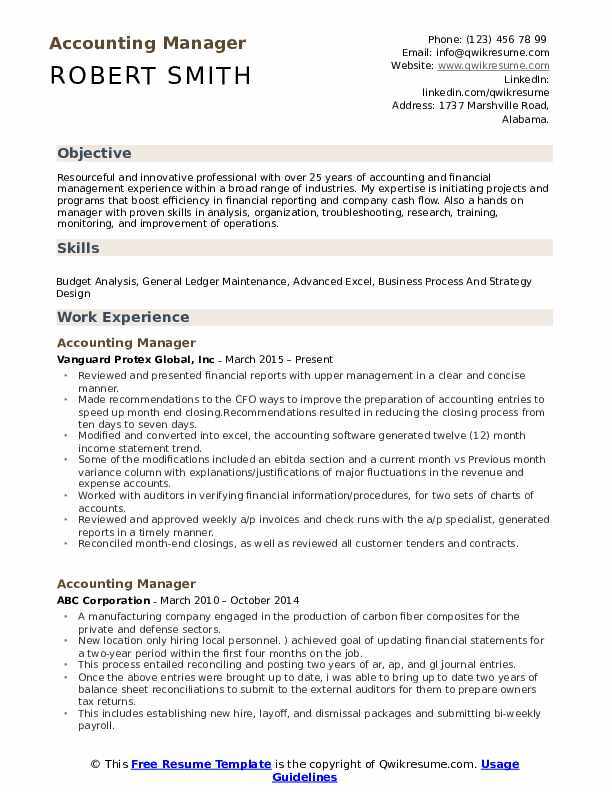 Headline : Dedicated accounting professional with over five years experience in general accounting, financial operations and business analysis. Experienced in monthly reporting, annual budgets and process improvements. Energetic team player with good organizational skills, strong accounting and systems knowledge. Manage, direct, supervise and coordinate the activities of the financial services division; to coordinate accounting activities with other divisions, departments and outside agencies including a city-wide accounting system. Provide administrative support to the chief financial officer: management responsibility for all services/activities of financial services division. Manage and participate in the development and implementation of goals, objectives, policies, and priorities for the financial services division; recommend, within departmental policy, appropriate service and staffing levels; recommend and administer policies and procedures. Continuously monitor and evaluate the efficiency and effectiveness of service delivery methods and procedures; assess and monitor work load, administrative and support systems, and internal reporting relationships; identify opportunities for improvement and review with the chief financial officer; implement improvements. Select, train, motivate and evaluate personnel; provide or coordinate staff training; work with employees to correct deficiencies; implement discipline procedures; recommend employee terminations. Plan, direct, coordinate and review the work of assigned division staff; meet with staff to identify and resolve problems; assign work activities, projects and programs; monitor work flow; review and evaluate work products, methods and procedures. Supervise, review and verify a variety of documents and forms for the financial services division including reports, letters, agendas and authorizations; review and approve accounting entries and transactions. Prepare, supervise and review the preparation of various audit work papers and schedules, relating to the services and activities of the financial services division; develop and monitor internal control procedures for the financial services division resulting from independent and internal auditor's recommendations and self-assessment. Develop, implement and administer city-wide accounting and auditing system; assist in the preparation of instructions, directives and manuals for accounting systems. Headline : Seeking a position in the Accounting Department, where my experience will be further developed and utilized. Detail-oriented, efficient professional with experience in accounting systems. Possess strong analytical and problem solving skills, with the ability to make well thought out decisions. Highly trustworthy, discreet and ethical. Steerheaded and chaired committee in the implementation of new project management/accounting software, clearview infocus. Preparation of financial and staff utilization reports on a consistent basis. Manage accounting staff in day-to day accounting functions - data entry, ap/ar, reporting, etc. , month end closings including all necessary journal entries. Bi-weekly payroll processing, annual 1099 preparation, and monthly bank account reconciliations. Create and send monthly invoices to clients utilizing standard construction phases. Follow up on a/r collection issues, review all associate (and ic) time cards and expense reports, including reconciliation and receipt collection. Provide input and support to the development and implementation of new initiatives to improve project accounting processes, provide assistance, financial information, and training to operations staff as required. Communication of policies and procedures, and assistance with financial information. Partner with operations to enhance the flow of information to project accounting team, maintain communications with pm's and senior managers regarding project accounting functions and changes that may impact their work, including supporting staff in other duties as needed. Responsible for year-end closing in unison with the organizations' cpa. 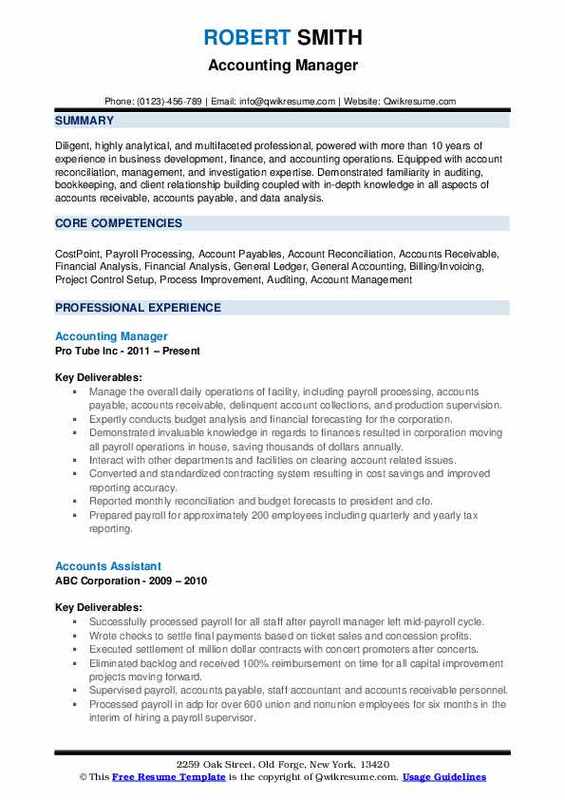 Summary : Dedicated Accountant with five years of experience developing and implementing strategies, processes and controls; establishing accounting functions, systems and best practices; payroll administration, corporate accounting, not for profit accounting, and accounts payable. Well organized, highly motivated, efficient, and dependable. Seeking a workplace that inspires a collaborative environment and opportunities for professional growth while respecting the need for work-life/leisure-life balance. Bimonthly bank reporting- responsible for completing borrowing ability with bank by completing a report based on ap & ar analysis. Manage company logistics- manage and process international shipments, quotes and harmonized codes with freight carriers. Weekly cash flow forecast- projected ar receipts & ap payments weekly and prioritize cash efficiently in a tight cash flow situation. Back up for the payroll department- manage and process payroll for over 75 employees using paychex software. Process new customer credit package along with d&b report and submit to cfo for approval. Bank reconciliation- reconcile two bank accounts and one credit card statement monthly maintained a weekly and monthly office supply budget. Accounts payables-processing and updating daily invoices, communicating with vendors on payments status and creating payments. Accounts receivables- sending invoices to customers daily, payment posting, reconciled accounts and address any discrepancies. Process cash disbursements weekly- issue checks, ach's or wires for more than 100 vendors. Freight reporting analysis- provide a breakdown of the costs for international and domestic freight usage for the whole company every month. 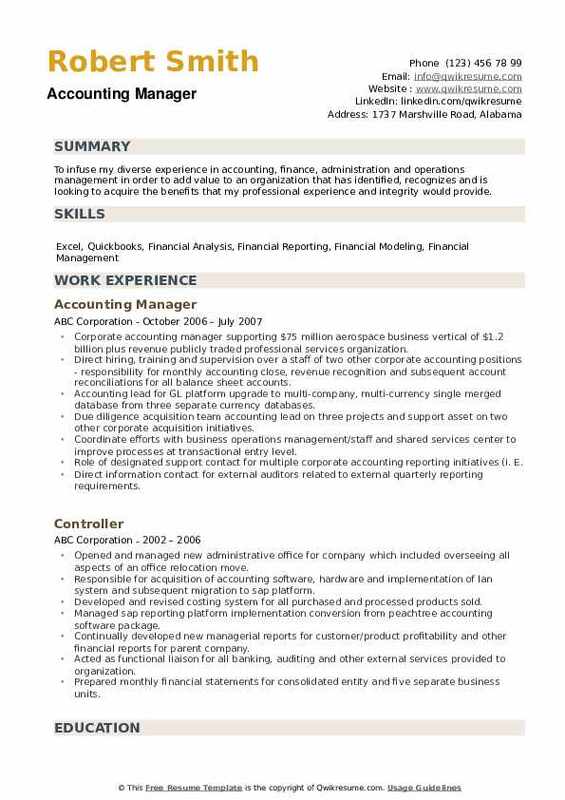 Objective : CPA licensed Accounting Manager with over 5 years of full-time corporate accounting tenure. Additional work experience in all facets of small business accounting through part-time employment. Responsible for the preparation of financial statements in accordance with gaap for five companies responsible for the month, quarter, and year end closing/reporting. Manage travel & expense reports and credit cards for multiple companies. Supervise accounts payable and accounts receivable for accuracy and completeness. Manage the coding and processing of overhead invoices as well as payments. Maintain fixed assets schedule as well as book depreciation/amortization entries for reporting. Provide supporting documentation and schedules for the month, quarter, and year end close. Manage the treasury/bank activities including wire transfers/payments and recording in gl. Responsible for all bank reconciliations and daily cash reports for 5 companies. Responsible for monthly and quarterly internal management reports responsible for tax filings - sales & use tax. Objective : To infuse my diverse experience in accounting, finance, administration and operations management in order to add value to an organization that has identified, recognizes and is looking to acquire the benefits that my professional experience and integrity would provide. Corporate accounting manager supporting $75 million aerospace business vertical of $1.2 billion plus revenue publicly traded professional services organization. Direct hiring, training and supervision over a staff of two other corporate accounting positions - responsibility for monthly accounting close, revenue recognition and subsequent account reconciliations for all balance sheet accounts. Accounting lead for GL platform upgrade to multi-company, multi-currency single merged database from three separate currency databases. Due diligence acquisition team accounting lead on three projects and support asset on two other corporate acquisition initiatives. Coordinate efforts with business operations management/staff and shared services center to improve processes at transactional entry level. Role of designated support contact for multiple corporate accounting reporting initiatives (i. E.
Direct information contact for external auditors related to external quarterly reporting requirements. Objective : Seeking a position in financial analysis/management where excellent analytical and technical skills can be utilized to improve the company's profitability. 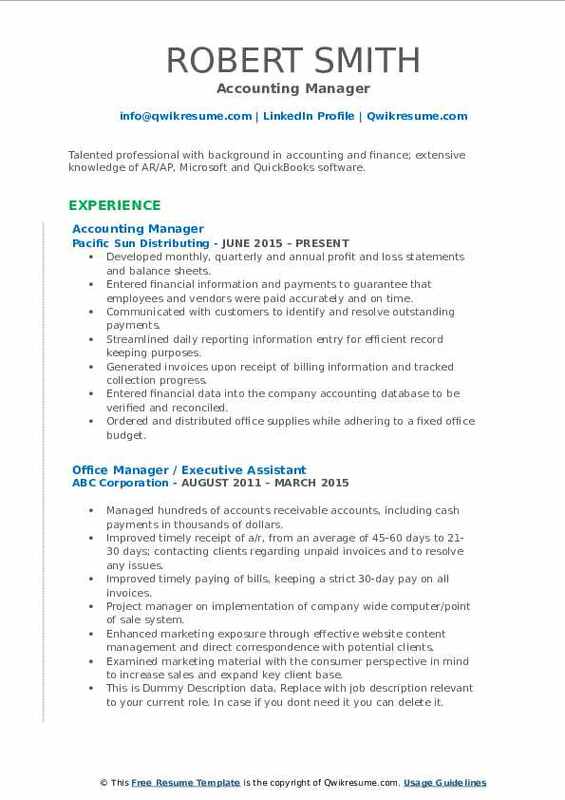 Skills : Proficient In Microsoft Office. Experienced With JD Edwards, Hyperion Essbase, Traverse, Corptax, Pensoft Payroll, Intuit QuickBooks And Creative Solutions Accounting. Knowledgeable In The Interpretation And Application Of Both U.S. GAAP And IFRS. Excellent Analytical And Organizational . Independent Problem Solving. Strong Communication . Manage the direct activities of accounts payable specialists and all aspects of accounts payable processing. Responsible for the maintenance of vendor terms to insure that all payments are made within terms. Execute all money wires as approved by the cfo and process in a timely fashion ensuring all recurring wires are processed as required. Manage the finance department's month-end close including journal entries, account analysis, reserve analysis and financial statement preparation. Reconcile global accounting activity and assist with the month-end close for international sites. Manage american express, purchasing card and concur travel and entertainment transactions ensuring all transactions are booked accurately to the general ledger. Review and analyze current processes liaising with outside consultants in order to implement efficient process improvements. Manage dun & bradstreet preferred vendor listing and collaborate with consultants to improve overall credit ratings. Summary : Diligent, highly analytical, and multifaceted professional, powered with more than 10 years of experience in business development, finance, and accounting operations. Equipped with account reconciliation, management, and investigation expertise. Demonstrated familiarity in auditing, bookkeeping, and client relationship building coupled with in-depth knowledge in all aspects of accounts receivable, accounts payable, and data analysis. Manage the overall daily operations of facility, including payroll processing, accounts payable, accounts receivable, delinquent account collections, and production supervision. Expertly conducts budget analysis and financial forecasting for the corporation. Demonstrated invaluable knowledge in regards to finances resulted in corporation moving all payroll operations in house, saving thousands of dollars annually. Interact with other departments and facilities on clearing account related issues. Converted and standardized contracting system resulting in cost savings and improved reporting accuracy. Reported monthly reconciliation and budget forecasts to president and cfo. Prepared payroll for approximately 200 employees including quarterly and yearly tax reporting. Produces monthly financial packages ensuring that costs are properly recorded and budgets are maintained. Directly accountable for bank transfers, asset management, and preparation and review of monthly journal entries. 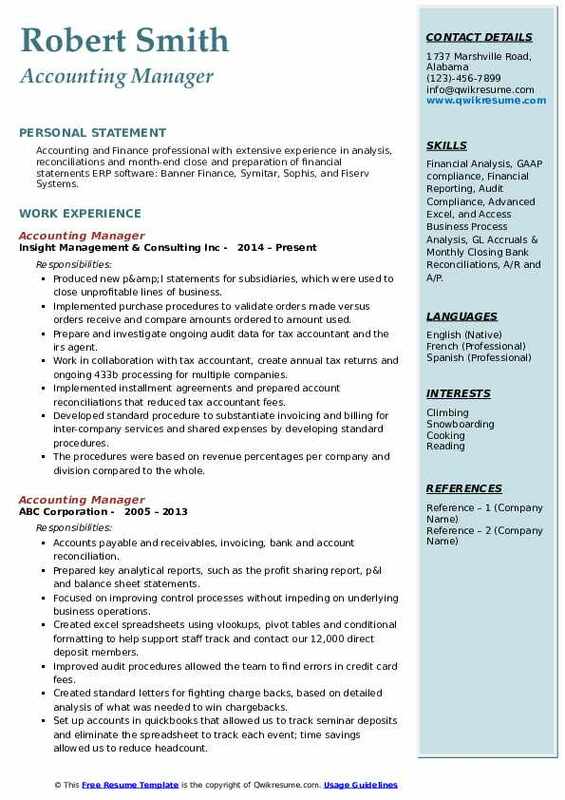 Summary : An accounting professional with over ten years of experience possessing multiple skills in audit reviews, budgeting, cash management, cost accounting, financial statement reporting, fixed assets, general ledger reconciliations, and trend analysis. Directed the day-to-day operations of the accounting staff that included accounts payable and senior accountant. Responsible for the full accounting cycle including financial reporting, statement analysis, monthly reconciliations, and cash management for two companies. Administered and developed current accounting policies and procedures to improve the accuracy and timeliness of all financial data prepared the monthly financial packages that included the balance sheet, income statement, cash flows, and supporting schedules. Prepared weekly and monthly asset based lending reports that included an ar and inventory analysis for our financial lenders. Coordinated the annual bank and lending audit schedule for a $360m asset based revolver facility that included financial reports, supporting documentation, and trend analysis. Coordinated quarterly and year end audit schedules with kpmg that included financial reports, inventory evaluation, fluctuation analysis, and quarterly state of the business. Prepared the holding company's year end consolidated audited financials that consists of six individual operating companies. Prepared the consolidated quarterly financials and debt covenant calculations for our financial bankers and lenders maintained the daily cash flows spreadsheets for individual company and consolidated revolver loan facility.